1) I am a no-heat type of gal, so if I am creating this style after washing my hair, I braid or twist my hair to stretch it out. 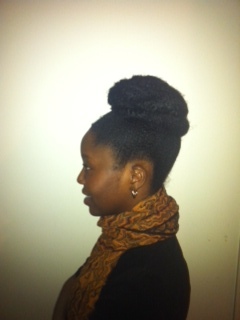 That way, if I choose to, I can rock a braid- or twist-out for a few days before creating the bun. Be mindful of the fact that the size of your Afro puff will determine how large your faux bun will look as you are wrapping the Marley hair around your real hair. 2) Once it’s time to pull the hair up, spritz around the sides of the hair with a bit of water, then take a wide tooth comb and comb the hair a bit from the root to stretch it out some more. Do not comb completely through a section of hair as your hair will be mostly dry and you don’t want to break your hair (or the comb!). *Optional: Use palm-sized handfuls of Ecostyler gel on your hair to make the style sleeker. Make sure to catch your edges, and brush it up with a boar bristle brush. This gel is awesome because it does not leave your hair hard and flaky, looking like the up-dos of yesteryear. And if you’re still a fan of the 90s, feel free to brush down a few baby hairs. 3) Pull the hair up with a hair-tie or hair band. I use a knee-high stocking because it is very stretchable and makes it easier for me to neatly tie up my hair. If you used gel in your hair, tie a silk scarf around your hair, starting with the back to ensure that it lies as flatly as possible. You can tie a second scarf around the hair to secure the first scarf and achieve maximum smoothness. Sleep with this get-up overnight or rock it for a couple of hours if doing the style the same day. 4) Tie a long hair band around the middle of the Marley hair. Tie the leftover bit of the hair band around your puff so that the Marley hair is hanging in two pieces on the right and left side of your face. Start with the right or left side and wrap the Marley hair all the way around the side of your hair. Secure it with pins. Take the remaining side and pull it over your hair that is peeking through the bun. Secure that with pins. 5) There will be a bit of Marley hair left. You can pull it back over your bun and tuck it into the middle, or you can separate the remaining hair into two sections and pin them around either side of your bun.